Does size equal luxury? Do 22″ low-profile tires make sense on a body-on-frame 4X4? We answer these questions and more in our Lincoln Navigator review. All things are relative. Testing the 2015 GMC Yukon Denali XL last month, I was introduced to the concept of large for the sake of it. 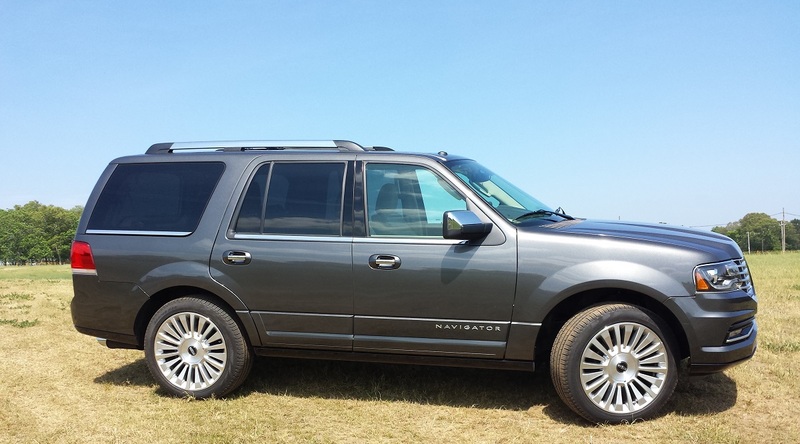 This 2015 Navigator is Ford’s Lincoln premium division version of large luxury. After two minutes in the vehicle, my first thought was “Is this vehicle much more manageable than the Yukon XL, or am I crazy?” Maybe both, but my first stop in the Navigator happened to be at a local business. Outside was parked a Yukon Denali XL and as you can see in the photo large is relative. The Navigator is the pipsqueak of the group. The Navigator handles much better than you would guess by looking at it, and its shorter length means that when you go shopping it doesn’t stick out into the aisle. 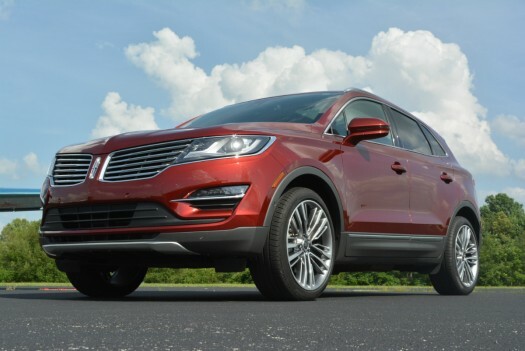 Lincoln may have found the very edges of “too big” and created a Navigator that comes in just under that benchmark. This being a vehicle designed for luxury, we should start our analysis there. Yes, the Lincoln is splendid inside. 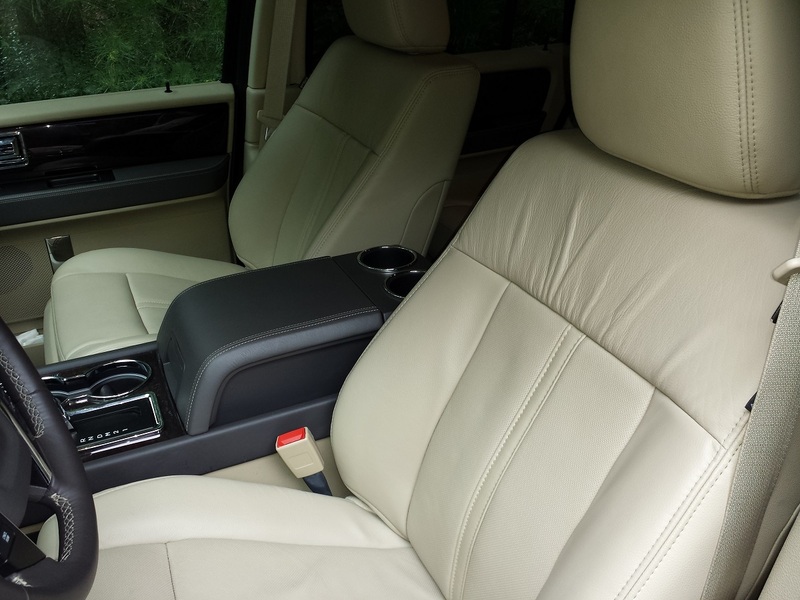 The leather seats in the first two rows are perforated, ventilated, and heated. The passenger seat has all the expected power controls one could wish for including lumbar support. The seat and wheel do move to let you in and out easier, a nice touch. The greenhouse is huge. Glass seems everywhere, and you can see very well. Being about two feet above even large crossovers give you a commanding view of the road. The Navigator places you up high, and the effect is intentional. The dash is nicely constructed. Most importantly, the Synch infotainment system is operated by a simple touch-screen. No remote mouse to fiddle with. Kudos to Lincoln for not trying to mimic the mistakes of its German and Japanese counterparts in this regard. The HVAC controls are simple as well and easy to use. One gripe we have is that the heated seats don’t stay on after you shut off and restart the Navigator and there is no setting in the menus to correct this. 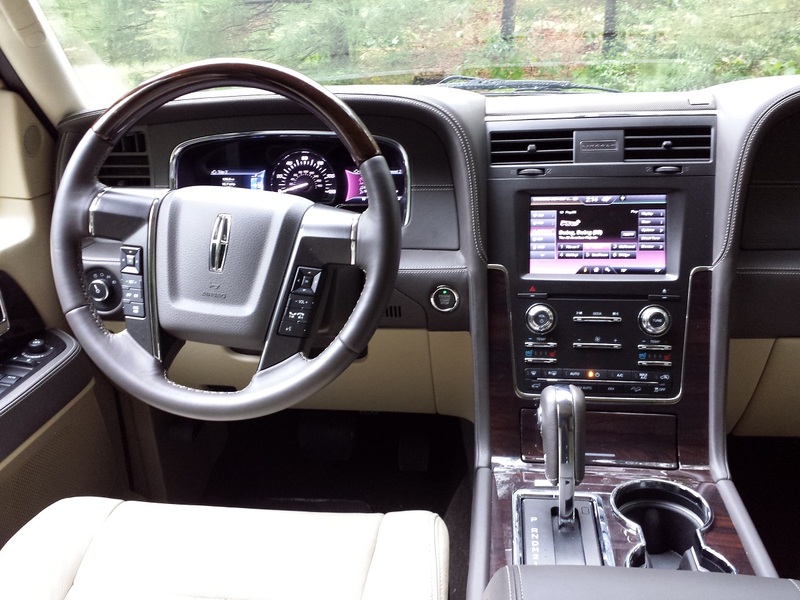 As we mentioned from the outset, the 2015 Lincoln Navigator handles pretty well. Particularly if you drive like an adult. If you try to push the Navigator around a bit, the engine is more than willing, but the mass of the thing starts to reveal itself. It begins to feel a bit boat-like. You arrange it in the proper direction, apply thrust, then brake, then turn it, then do all that again. The Navigator is not at all like a Range Rover, or frankly, any premium large crossover. That said, this is a vehicle for adults, and when driven at legal speeds it feels nice, not clumsy. Given the look of this leviathan you would expect a floaty, creamy-smooth ride. Nope. The massive 22″ wheels shod with low-profile tires allow you to feel the road. That is both good and bad. Large broken sections of roadway, which is what my area now consists of in total, create some shake in this vehicle. The steering also seems to be affected. The Navigator seems to follow the road’s contours a bit. Not horribly, but enough that you will have to steer it just to go straight. Since we are on the topic, let’s ask ourselves if these tall, low-profile tires make sense on a vehicle with 4×4. I say no. Back to the positives, the V6, turbocharged Ecoboost engine and 6-speed automatic transmission are wonderful. There is no sense at all that a turbo is under the hood. Ford is one of very few automakers who can hide the negatives of a turbo. Power is abundant all the time. Floor the Navigator and it leaps ahead. You will never miss the V8. Our running fuel economy was 18 MPG, better than the EPA’s estimated 17 MPG combined rating. Make your own call on whether that is acceptable. At least it takes regular unleaded. The Navigator can tow up to 8,700 pounds. During my test, I did not tow with the vehicle, but it seems more than capable of pulling any manner of plaything behind it while still hauling eight people to a distant vacation spot in comfort. 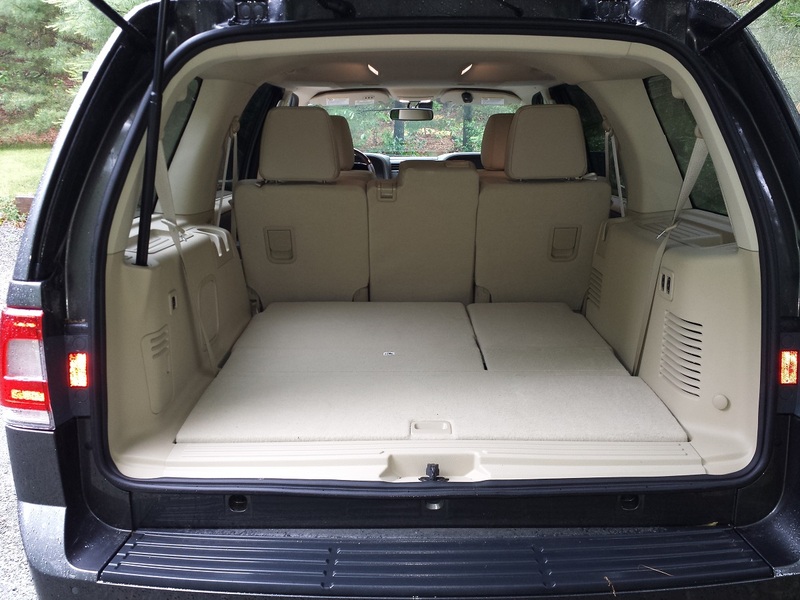 Drop the third row and you have a massive cargo area. Drop the middle row and you have a queen-sized bed area that is completely flat. 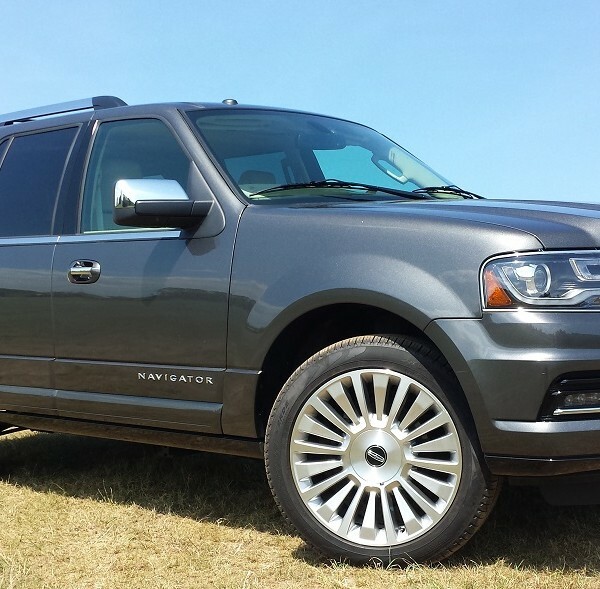 In terms of safety, the 2015 Lincoln Navigator has not been rated by IIHS. There is no forward collision auto braking system. However, hitting other things with a 6,500 pound hunk of steel generally means those other things become the crumple zones for your Navigator. 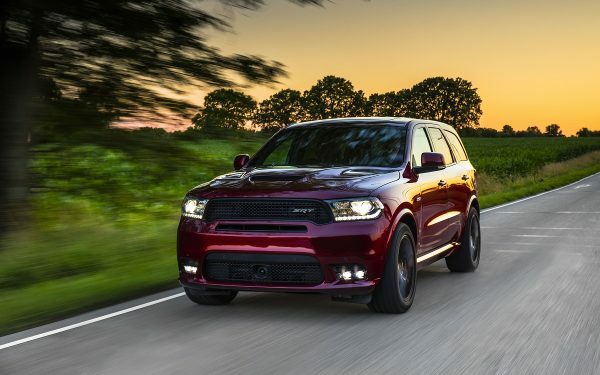 Huge, 4×4 SUVs have a lower death rate than average. In conclusion, the 2015 Lincoln Navigator is a big vehicle in a segment with very small sales numbers. 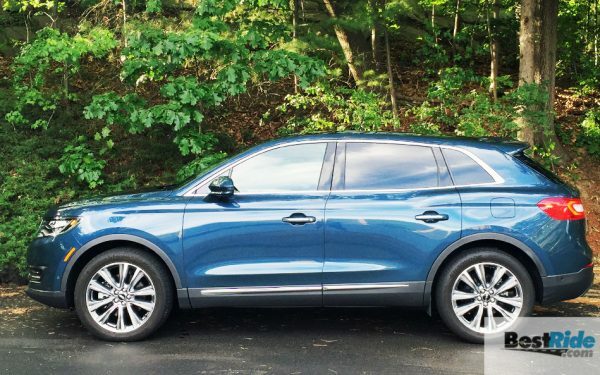 If you are looking for a comfortable vehicle for eight passengers that can tow like a truck and still squeeze into a parking space, this may be a great place to start your search.